The Kentucky senator says in Maine that Republicans must be a broader party to win national elections. BANGOR — Republican U.S. Sen. Rand Paul was in Maine on Saturday with one major proclaimed goal: broadening the party, possibly ahead of a presidential run in two years. 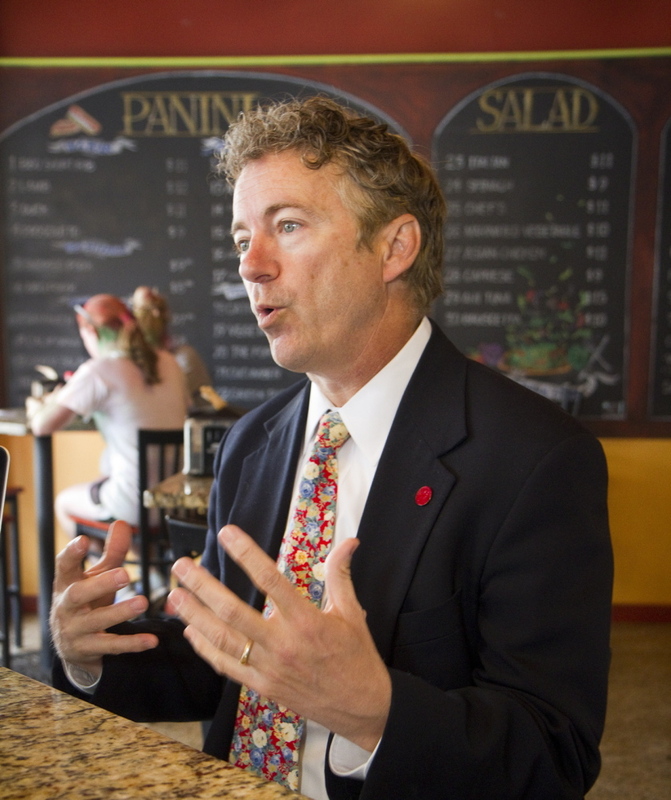 Paul, a freshman senator from Kentucky who has a libertarian streak and is one of the leading potential hopefuls for his party’s 2016 White House nomination, sat down with the Maine Sunday Telegram ahead of his speech at the Maine Republican Convention in Bangor. He discussed his aspirations, his goal for the party nationally, and federal spying, along with the intersection of those issues with Maine politics at a convention aiming to unite the party two years after Paul’s father, Ron Paul, a presidential candidate in 2008 and 2012, divided Republicans here. Q: You’ve been doing well in presidential polls and surveys lately, including in Colorado, New Hampshire and at the Conservative Political Action Conference. Will you still be waiting until after the midterms to decide on a run, and what’s weighing on that decision? A: I think it’s too early; I think we need to do one election at a time and people get overwhelmed with more than one. Part of the decision-making process is working things out and deciding with my family whether or not we’ve got the energy, time and gumption to do something that’s an enormous undertaking, and some of it is just seeing where things are after the next election cycle. I’m trying help us win the Senate … but I’m mostly trying to help us expand the party because I think the Republican Party’s got to be bigger for us to win more races. Q: Last cycle, your father was at the center of a feud in the Maine Republican Party, which divided groups of Republicans. You’ve been in the Northeast over the past few days meeting with ex-Mitt Romney aides ahead of that potential presidential run. Are you acknowledging that you would need to expand on the base that spurred him in his runs? A: Yeah, I mean, you win elections by bringing people together, not dividing them, and I believe that really there’s a lot of commonality between folks in the Republican Party and we need to learn somewhat from the Democrats. The Democrats have a hundred different coalitions in their party and they seem to come together to be a bigger party. We need to do the same things. Q: You’re facing divides in your party, particularly on your largely noninterventionist foreign policy. Many have been calling your response to Russia’s invasion of Ukraine, for example, inconsistent. You call it nuanced. How do you reconcile your Time magazine op-ed calling for a harsher stand from President Obama with past statements in which you’ve said we must be hesitant to “tweak” Russian President Vladimir Putin? A: Ever since Putin illegally occupied Crimea my position has always been the same. Some of the positions I said in advance of that had nothing to do with that or were (addressing) core events that obviously had changed. My position has always been the same: If Putin’s going to act like a rogue, if Russia’s going to act like a rogue nation, they’ll be treated as such. They’ll be isolated in the community of nations and we’re going to make it very difficult for them. Q: You’re going to join U.S. Sen. Susan Collins for a state party fundraiser today. She’s defended National Security Agency spying programs you oppose, and she’s also running against a Democrat, Shenna Bellows, who comes pretty close to sharing your views on that and other privacy issues. Do you support her, despite disagreement on many of those issues? A: I wholeheartedly endorse Senator Collins for re-election. I think she’s doing a great job for Maine and for the country. … I don’t really know, exactly, what her position is on the NSA; you’d have to ask her about that. I just know my position, but I think we’re a big political party. There’s room for not-entire agreement on every issue. Q: Maine has a lot of very different Republicans running again for high office this year, from Gov. Paul LePage on the right to Collins, a moderate. Especially given the division in the party here in 2012, do you see your appearance today as having a unifying effect? A: Absolutely. I’ve done everything I can in my state and everywhere I’ve traveled to try and bring people together in the sense that some of these fights occurred all across the country. I won my primary with 64 percent of the vote, and since then, have worked with my senior senator in my state (Senate Minority Leader Mitch McConnell) to really try to forge a relationship where we’re a bigger, stronger party.